Ford has had the best-selling truck in America for the past 37 years and for the past 32 years the F-150 has also been the best-selling vehicle in America. Overall annual sales of the F-150 is higher than many smaller manufacturer’s sales for their whole vehicle lines. Now for 2015 the F-150 has been redesigned with a much anticipated aluminum-body construction and many other innovative features. Ford is relying on this launch to carry the brand. 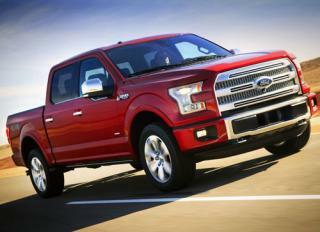 Fortunately for car shoppers, Forbes has put together a list of the top 10 innovative features on the 2015 F-150. Aluminum Body – An aluminum body is the key change in the 2015 F-150, which made it’ debut at the Detroit Auto Show in January of this year. Aluminum construction has reduced the total weight of the vehicle by 700 pounds and allowed the max payload and towing to increase to best-in-class performance. Digital Gauges – The optional 8-inch digital MyView gauge cluster lets you customize the display to see all sorts of information regarding trailer status, off-roading, tire pressure, and fuel economy. MyView lets the driver sort and organize their top seven favorite gauges in the cluster. Driver Assist – The new F-150 is the first full-size pickup with active park assist, which not only ID a large enough parking space, it can manage all of the steering required to parallel park the truck. This is a great feature for a truck that can be over twenty feet long. Additional high tech driving features include blind-spot detection, lane-keeping assist, curve control, forward collision warning, radar cruise control, hill descent control, putting the F-150 on par with many luxury sedans. Remote Tailgate – Making use of the lighter aluminum panels, Ford has designed the first remote opening tailgate, which can also be locked and unlocked via the remote. Built-in dampening allows it to lower slowly. Nearly every inch of the F-150 has been remodeled with ecoBoost engines, LED lighting, and even new doors. For the rest of the list and to read more about the impressive features of the 2015 Ford F-150, click here. To find the best deal on your next truck let AutoBuying101.com help you compare quotes from local dealers and view inventory of cars for sale. The F-150 will be rolling into lots soon and AutoBuying101.com can have you in a new auto even sooner.